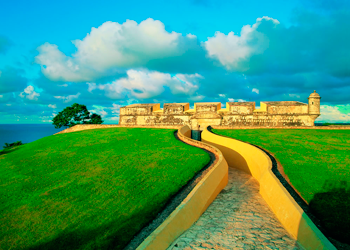 The state capital, also called Campeche, was declared a World Heritage Site in 1997. Today, much of the state’s economic comeback is due to the finding of petroleum offshore in the 1970s, which has made the coastal cities of Campeche and Ciudad del Carmen important economic centers. The state has important Mayan and colonial sites but they are not as well known or visited as others in the Yucatán. An early important site is Edzna, located near the city of Campeche in a region known as los Chenes. It was one of the most important ceremonial centers in the pre Classic Maya period (300-900CE). 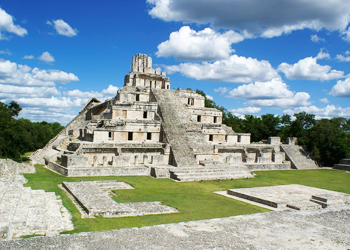 The largest archeological site in the state is Calakmul, which means “twin heaps” in Maya. It is located in the Petén region built in the late Classic period (500-900 CE). Calakmul is estimated to have been populated around 1000 BCE with its height at around 600 In 695 CE, Calakmul was conquered by Tikal and the city fell into decline. Is a Maya archaeological site in the of Campeche, deep in the jungles of the greater Petén Basin region. It is 35 kilometres (22 mi) from the Guatemalan border. Calakmul was one of the largest and most powerful ancient cities ever uncovered in the Maya lowlands. Calakmul was a major Maya power within the northern Petén region of the Yucatán of southern Mexico. Calakmul administered a large domain marked by the extensive distribution of their emblem glyph of the snake head sign, to be read “Kaan”. Calakmul itself is estimated to have had a population of 50,000 people and had governance, at times, over places as far away as 150 kilometers. 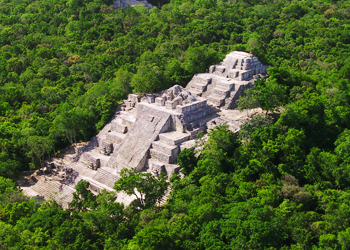 There are 6,750 ancient structures identified at Calakmul; the largest of which is the great pyramid at the site. Structure 2 is over 45 metres (148 ft) high, making it one of the tallest of the Maya pyramids. Edzná was already inhabited in 400 BC, and it was abandoned circa 1500 AD. During the time of occupation, a government was set up whose power was legitimized by the relationship between governors and the deities. In the late Classic period Edzná was part of the Calakmul polity. The word “Edzná” comes from “House of the Itzás” which may suggest that the city was influenced by the family Itzá long before they founded Chichen Itzá. The most remarkable building at the plaza is the main temple. Built on a platform 40 m high, it provides a wide overview of the surroundings. Another significant building located in the plaza is a ball court. If you go in the afternoon when the sun sets, it is worth the media spectacle of light and sound “The Light of the Itzás” recalls the splendor of the site and the customs of the Mayans who inhabited it.